It’s not often that I eat salads for dinner. They’re good and all, but they usually just don’t fill me (or my husband) up. This salad is definitely worthy of being a main dish, though. It was not only filling but also REALLY good! 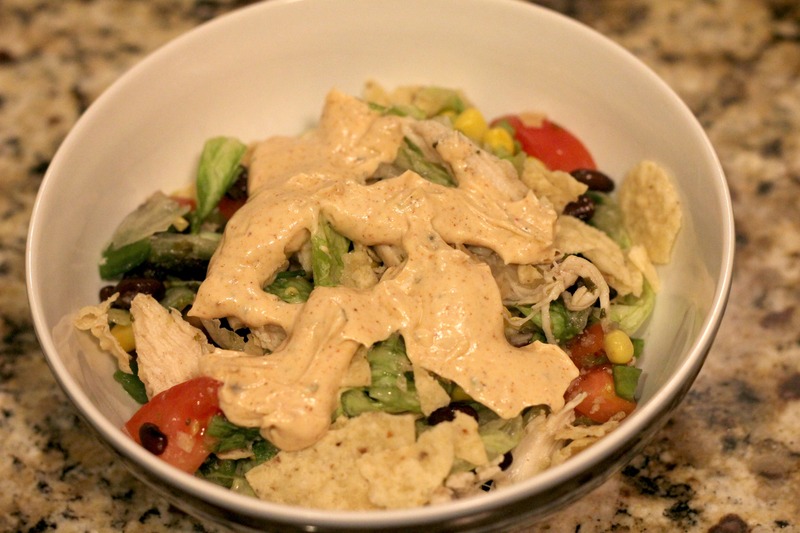 My favorite part of this dish was the chipotle ranch dressing. It was SO easy to make and is actually low cal! Typically I smother salads in Ranch dressing, meaning whatever healthiness I was trying to achieve by eating a salad goes out the window. Ranch has like 14 g of fat per 2 tablespoons, so yeah, it’s really unhealthy. However, this dressing is made with greek yogurt and light mayo, AND it was really good! I mean, usually I don’t like any dressing other than Hidden Valley Ranch, but this stuff was GOOD. I loved having the tortilla chips in the salad. They were like Mexican croutons. The chicken and the veggies all loaded up in this thing really make it fill you up. We LOVED it. You could also easily leave out the chicken to make it vegetarian-friendly. My one complaint is that it doesn’t really do well as leftovers. I wanted to eat it for lunch but it was all soggy and wilted. Guess that’s salad for ya. 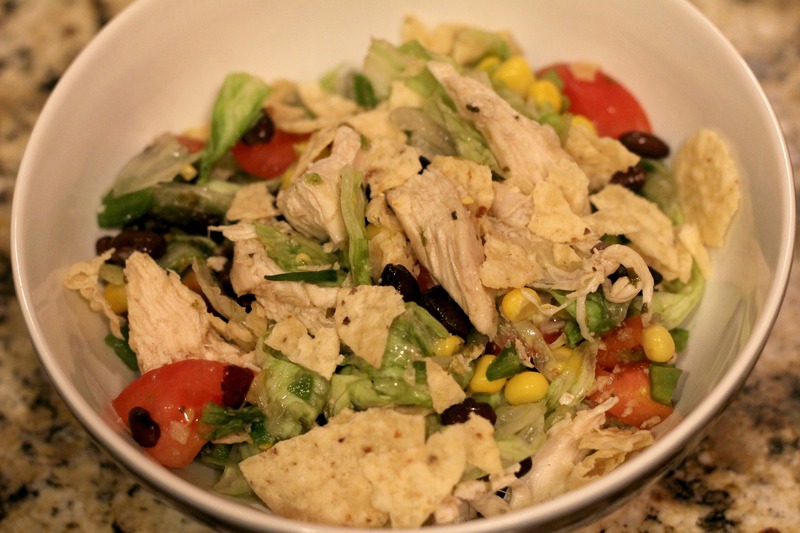 In a large bowl, combine all salad ingredients together, except the tortilla chips. In a small bowl stir all dressing ingredients together. Pour dressing over salad. 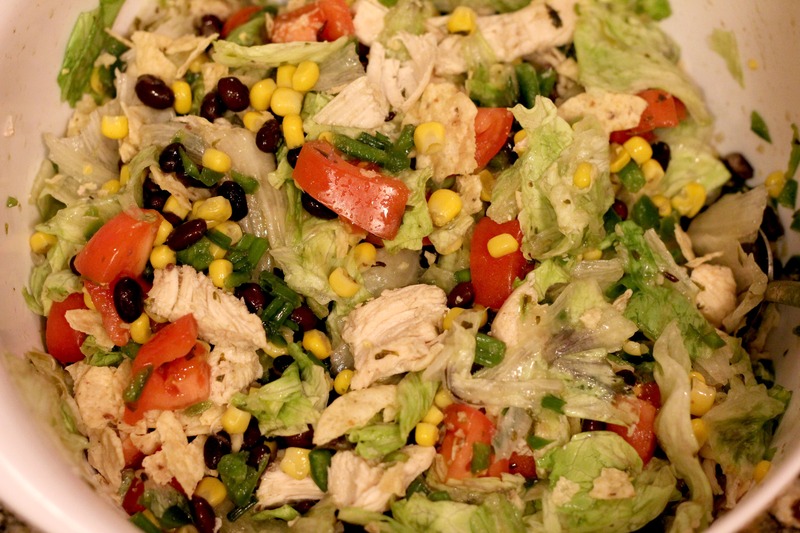 Toss to combine, then gradually add more dressing until it is dressed to your liking. Top with tortilla chips. Sounds delicious!!!! I wonder how it would taste if I sub Greek yogurt for mayo? I wondered that same thing! If you try it, let me know how it turns out! I’ve been searching for an authentic ‘Chipotle ranch dressing’ recipe. Sorry, but putting a pack of taco seasoning in a container of ranch dressing DOES NOT MAKE CHIPOTLE RANCH DRESSING. Sorry this isn’t “authentic” enough for you. But this blog is about quick, simple, family-friendly recipes. And in the Normal Cooking world, taco seasoning and ranch dressing is a fine substitute for the “authentic” kind.